One week passed, and then another. M had itchy feet and a desk full of work, and Zo & I couldn’t bring ourselves to go to what we had come to know as “M’s restaurant” without him. And then it was M’s birthday. And we weren’t taking no for an answer. As we wander up to the glass fronted building, next to that ever colour-changing fountain, we spot a blackboard in the corner. It says, among other things, three words that send M into a flurry. “Maggi Mee Goreng!” he sings as we are shown to our table. “Maggi Mee Goreng!” he sings as we peruse the menu. “Maggi Mee Goreng! Maggi Mee Goreng!” We are overheard. “I’m sorry, but the new menu only starts on Thursday” we are told. “Dammit!” says M. We peruse the menu again. There are four of us now. Two hungry boys who will eat anything, one hungry boy who will only eat Halal, and me. “D’you think it’s Halal?” asks Zo, hopeful, but willing to eat vegetarian if he must. “Nah“, say we. “There’s bacon on the menu“. “I’m gonna ask anyway” says he. Marcello, co-owner and chef, comes over to have a chat. 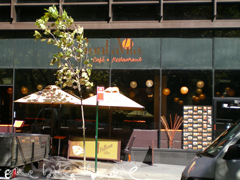 He explains that everything on the menu is halal – except for a couple of the Rizzas. Eyes light up. Options have been opened. We are thrilled. Then he explains that all of the meat used is halal, properly blessed and all. And that an entirely different set of utensils, pots and pans are used for non-halal food to avoid cross contamination. Our food arrives and the lamb curry is delicious, a must-repeat order. The meat is tender and unctuous, falling apart with the prod of a fork. The curry is rich with tamarind and spice. We start politely. A little bit of rice, a spoonful of curry. A couple of pieces of meat. And then its hits us “Heyyyyyy….” says one, pointing and nodding “Ohhhhhh…..” says another, with a grin. Me? I’m chewing away happily and hoping that no-one will notice that the plate has inched its way closer to me. The won ton mee arrives next. M & I look at each other knowingly. It is hard to get a good won ton mee in the city, nay, anywhere in Sydney really, and we are fingers crossed and hoping for the best. Zo is just excited about the fact that it’s halal. “I’ve never had wontons before” he exclaims eagerly. “Never?” we respond, before realising that they’re normally made of pork. While this exchange takes place, I notice that the sauce has been mixed in with the noodles (good) and that the chilli is hot (good) and that the wontons are cooked just right (very good – especially as most places under or over do them). The verdict? It’s positive. Wonton Mee is my favourite back in Malaysia, and this is as good as I’ve had in Sydney. And then the Rizzas arrive. I feel I have to capitalise the word Rizza. It feels wrong not to. 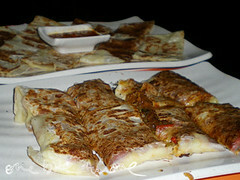 For Rizzas are a roti-pizza connundrum. 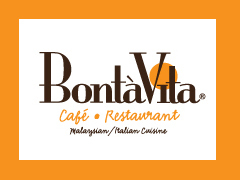 They are the only cross-cultural item on the Bonta Vita menu, the rest being either very Malaysian or very Italian. “The other fusion combinations we tried, they just didn’t taste so good” explains Marcello. No beef rendang spaghettini then. Good-oh. 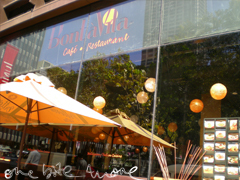 In the words of my friend Mak, who came along to Bonta Vita with me the following Saturday, “Ohhhh…. it’s like the best part of roti and the best part of pizza all in one go!” I didn’t hear much from him for the rest of the evening. The Rizzas we ordered were delicious. Personal favourites? I actually liked the vegetarian one (below) the best. The capsicum really stood up in it and made me happy. 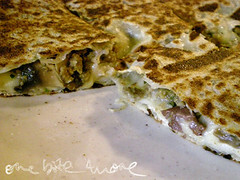 I also tried one with chicken mince in it on a separate occasion, and that one comes a close second. They are truly genius. 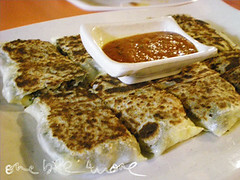 Flaky roti pastry. Melted mozzerella. 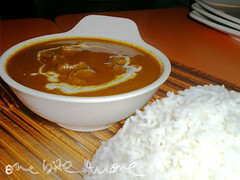 And the BV sauce, a thick, sweet-ish, mild curry which goes so well with everything. The waitstaff were attentive enough to notice that we were sharing, and, after the first one came out saw that I was hacking at it with my fork and knife. It was duly taken back to the kitchen, cut up and returned. 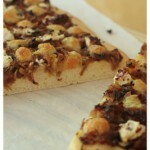 The other two Rizzas then arrived pre cut for ease of sharing. I was duly appreciative. So we’re chowing down. I’ve managed to hijack the rest of the wonton mee. The Kiwi is making short work of the curry and the other two are digging into the Rizzas when another plate arrives. “Have some Roti” says Marcello. “On the house.” Why, thankyou! And muchly so! But where do we put it? Our table is already spilling over with plates of food. So a table is pulled over, and we continue. And when a second plate of roti arrives, it is tipped ceremoniously on top of the first, and that lamb curry that The Kiwi had been working through? Well, I showed him. Not long after, another plate is brought around. “Otak Otak” we are told. “It’s for the new menu. Please, let me know what you think.” We are not the types to say no. 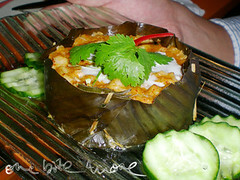 Especially when we are offered a fish and coconut filled banana leaf, with a surprising basil infused bottom. Toothpicks are carefully removed. The inner mass is ceremoniously cut into four pieces and doled out. Tender chunks of white fish and creamy coconut milk (infused with a hint of the banana leaf and basil) roll around in my mouth. I am eyeing The Kiwi’s portion, but my eyes are bigger than my stomach. A truce is called. My eyes are defeated and my stomach distended. I am utterly stuffed. The Kiwi is called back to work, and the other two chomp away contentedly while I sit and contemplate when and with whom I should make my return visit. We think we are done (and by this stage, M is slumped in his seat like a boy who’s eaten that bit too much and is halfway to settling down for a nap). But the surprises don’t stop. I smell, wait, what? Sparklers? 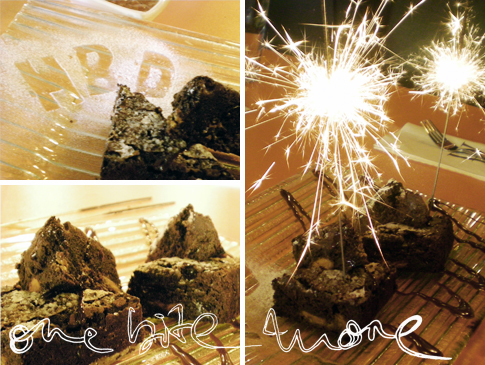 And a two-person birthday serenade is had, complete with four triangles of rich chocolately brownie and a duo of sparkers atop. As the Kiwi has had to depart, there is an extra piece of brownie on the plate. “I’m not having it” I say, whilst digging into my piece “I’m on a quest to eat less these days. Also, I’m far too full“. The boys laugh at me. And with good reason. Because as they hit the half way point, I’m all done with my triangle. And by the time they’re done with theirs, I’ve forked my way through most of the spare one. Hm. So full tummies abound as we drag ourselves back to work. I promise to return, and do so a week later with Miss Shiny, Mak, SuperDanny & PRC. More of the same is had, plus some dessert and a bonus plate of gelati (My favourites? The durian & the wattleseed gelati. Such a win). But that’s another story, for another day. 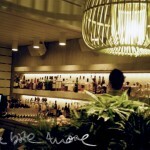 I so have to try this place-I mean a rizza? Who could refuse just out of curiosity! Phew. 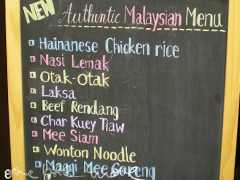 I thought there really was going to be beef rendang spaghettini! The goat curry looks fantastic, as does the won ton mee! I love the Rizza soo gooooddd and their BV sauce matches them sooo well mmmmm!!! and did you see the ex-Mamk Roti Chef? i’ve never heard of a malaysian/italian fusion restaurant. how intriguing.. must “research” this place. soon!! 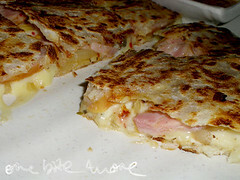 Oh, so a Rizza is like Murtabak with an Italian filling? Makes sense, sort of. 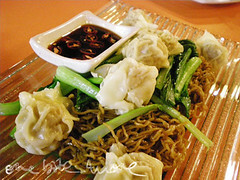 Wonton mee is my very very favourite. I might just have to break my distaste for fusion and visit just for that dish – though do they do the wontons fried, too? Lorraine: oh do! that’s what i thought initially, but have grown quite fond of everything else too. Y: i know right? hoorah for not-odd-fusion! Betty: hehe. let me know how your “research” goes! 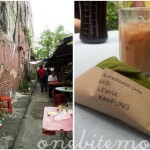 Stephcookie: it’s not like in Klang, but considering the other options, i’m more than happy with it. That’s awesome that you got to taste the new menu! 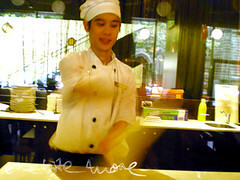 I’m so impressed that the chef makes halal food – it’s so considerate. Looks really good, but I do have to squirm at the price for the wonton noodle. 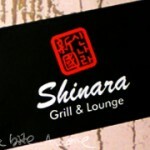 I can see another round of foodie gathering at this joint already! OMG i walked past here a couple of weeks ago while looking for a feed and i saw how it says “malaysian and Italian cuisine” I thought to myself weirddd combo definitely not gonna try it. Glad u tried it cos it looks actually pretty good! Love ur entries SHEZ! Arwen: we were suitably happy with it too 🙂 return trips are being planned as we speak! smileona: give it a go, you’ll be pleasantly surprise i think!